Lombardy ( , Western Lombard: Lumbardìa, Eastern Lombard: Lombardia) is one of the 20 regions of Italy. The capital is Milan . One-sixth of Italy's population lives in Lombardy and about one fifth of Italy's GDP is produced in this region. Major tourist destinations in the region include the historic cities of Milan, Mantua , Pavia , Cremona and Bergamo , and the lakes Garda , Como , Maggiore and Iseo . The official language, as in the rest of Italy , is Italian. The traditional local languages are the various dialects of Lombard (Western Lombard and Eastern Lombard), as well as some dialects of Emilian, spoken in Provinces of Mantua , Pavia and Cremona. These are not widely spoken due to intense immigration from other parts of Italy whose local dialects were not intelligible with Italian. Lombardy is bordered by Switzerland (north: Canton Ticino and Canton Graubünden ) and by the Italian regions of Emilia-Romagna (south), Trentino-Alto Adige/Südtirol and Veneto (east), and Piedmont (west). Three distinct natural zones can be fairly easily distinguished in the Lombardy region: mountains, hills and plains - the latter being divided in Alta (high plains) and Bassa (low plains). The most important mountainous area is an Alpine zone including the Lepontine and Rhaetian Alps , (Piz Bernina , 4055 m), the Bergamo Alps , the Ortles and Adamello massifs; it is followed by an Alpine foothills zone Prealpi, which include the main peaks are the Grigna Group (2,410 m), Resegone (1,875 m) and Presolana (2,521 m). The great Lombard lakes, all of glacial origin, lie in this zone. From west to east these are Lake Maggiore , Lake Lugano (only a small part is Italian), Lake Como , Lake Iseo , Lake Idro , then Lake Garda , the largest in Italy. South of the Alps lie the hills characterized by a succession of low heights of morainic origin, formed during the last Ice Age and small barely fertile plateaux, with typical heaths and conifer woods. A minor mountainous are lies south of the Po, in the Appennines range. The plains of Lombardy, formed from alluvial deposits, can be divided into the Alta - an upper, permeable ground zone in the north and a lower zone characterized - the Bassa - by the so-called line of fontanili (the spring waters rising on impermeable ground). compared with the three distinctions already made is the small region of the Oltrepò Pavese, formed by the Apennine foothills beyond the Po River. A large number of rivers, all direct or indirect tributaries of the Po, cross the plains of Lombardy. Major rivers, flowing west to east, are the Ticino , the outlet of Lake Maggiore , the Lambro , the Adda , outlet of Lake Como , the Mincio , outlet of Lake Garda , and the Oglio , the Lake Iseo outflow. There is a wide network of canals for irrigation purposes. The climate of this region is continental, though with variations depending on altitude or the presence of inland waters. The continental nature of the climate is more accentuated on the plains, with high annual temperature changes (at Milan an average January temperature is 1.5 °C and 24 °C in July), and thick fog between October and February. The Alpine foothills lakes exercise a mitigating influence, permitting the cultivation of typically Mediterranean produce (olives, citrus fruit). In the Alpine zone, the valley floor is relatively mild in contrast with the colder higher areas (Bormio, 1,225 m, –1.4 °C average in January, 17.3 °C in July). Precipitations are more frequent in the Prealpine zone (up to 1,500–2,000 mm annually) than on the plains and Alpine zones (600 mm to 850 mm annually). In the plains, intensively cultivated for centuries, little of the original environment remains. The rare elm, alder, sycamore, poplar, willow and hornbeam woods and heaths are covered now by several protected areas. In the area of the great Alpine foothills lakes, however, grow olive trees, cypresses and larches, as well as varieties of subtropical flora such as magnolias, azaleas, acacias, etc. The mountains area is characterized by the typical vegetation of the whole range of the Italian Alps. At a lower levels (up to approximately 1,100 m) oak woods or broadleafed trees grow; on the mountain slopes (up to 2,000–2,200 m) beech trees grow at the lowest limits, with conifer woods higher up. Shrubs such as rhododendron, dwarf pine and juniper are native to the summital zone (beyond 2,200 m). The numerous species of endemic flora (the Lombard native species), typical mainly of the Lake Como area, include some kinds of saxifrage, the Lombard garlic, groundsels bellflower and the cottony bellflowers. Lombardy counts many protected areas: the most important are the Stelvio National Park (the largest Italian natural park), with typically alpine wildlife: red deer, roe-deer, ibex, chamois, foxes, ermine and also golden eagles; and the Ticino Valley Natural Park, instituted in 1974 on the Lombard side of the Ticino River to protect and conserve one of the last major examples of fluvial forest in Northern Italy. The area of current Lombardy was settled at least since the 2nd millennium BC, as shown by the archaeological findings of ceramics, arrows, axes and carved stones. In the following centuries it was inhabited first by some Etruscan tribes, who founded the city of Mantua and spread the use of writing; later, starting from the 5th century BC, the area was invaded by Celtic tribes. This people founded several cities (including Milan) and extended their rule to the Adriatic Sea. Their development was halted by the Roman expansion in the Po Valley from the 3rd century BC onwards: after centuries of struggle, in 194 BC the entire area of what is now Lombardy became a Roman province with the name of Gallia Cisalpina ("Gaul on the nearer side of the Alps"). The Roman culture and language overwhelmed the former civilization in the following years, and Lombardy became one of the most developed and rich areas of Italy with the construction of a wide array of roads and the development of agriculture and trade. Important figures like Pliny the Elder (in Como ) and Virgil (in Mantua) were born here. In late antiquity the strategic role of Lombardy was emphasized by the temporary moving of the capital of the Western Empire to Mediolanum (Milan). Here, in 313 AD, emperor Constantine issued the famous edict that gave freedom of confession to all religions within the Empire. During and after the fall of the Western Empire, Lombardy suffered heavily from destruction brought about by a series of invasions by tribal peoples. The last and most effective was that of the Lombards, or Longobardi, who came around 570s and whose long-lasting reign (whose capital was set in Pavia ) gave the current name to the region. There was a close relationship between the Frankish, Bavarian and Lombard nobility for many centuries. After the initial struggles, relationships between the Lombard people and the Latin-speaking people improved. In the end, the Lombard language and culture assimilated with the Latin culture, leaving evidence in many names, the legal code and laws among other things. The end of Lombard rule came in 774, when the Frankish king Charlemagne conquered Pavia and annexed the Kingdom of Italy (mostly northern and central Italy) to his empire. The former Lombard dukes and nobles were replaced by other German vassals, prince-bishops or marquises. The 11th century marked a significant boom in the region's economy, due to improved trading and, mostly, agricultural conditions. In a similar way to other areas of Italy, this led to a growing self-acknowledgement of the cities, whose increasing richness made them able to defy the traditional feudal supreme power, represented by the German emperors and their local legates. This process reached its apex in the 12th and 13th centuries, when different Lombard Leagues formed by allied cities of Lombardy, usually led by Milan, managed to defeat the Hohenstaufen Emperor Frederick I, at Legnano, and his grandson Frederick II, at Parma. This did not prevent other important Lombard centres, like Cremona (then rivalling Milan for size and wealth) and others, from supporting the imperial power if this could grant them an immediate advantage. Taking advantage of the flourishing agriculture, the area around the Po River , together with Venice and Tuscany, continued to expand its industry and commerce until it became the economic centre of the whole of Europe. The enterprising class of the communes extended its trade and banking activities well into northern Europe: "Lombard" designated the merchant or banker coming from northern Italy (see, for instance, Lombard Street in London). The name "Lombardy" came to designate the whole of Northern Italy until the 15th century and sometimes later. From the 14th century onwards, the instability created by the unceasing internal and external struggles ended in the creation of noble seignories, the most significant of which were those of the Viscontis (later Sforzas) in Milan and of the Gonzagas in Mantua. In the 15th century the Duchy of Milan was a major political, economical and military force at the European level. Milan and Mantua became two centres of the Renaissance whose culture, with men like Leonardo da Vinci and Mantegna, and pieces of art were highly regarded (for example, da Vinci's Last Supper). After the decisive Battle of Pavia, the Duchy of Milan became an Austrian possession, which was passed on to the royal Austrian Hapsburgs of Spain : the new rulers did little to improve the economy of Lombardy, instead imposing a growing series of taxes needed to support their unending series of European wars. The eastern part of modern Lombardy, with cities like Bergamo and Brescia , was under the Republic of Venice , which had begun to extend its influence in the area from the 14th century onwards (see also Italian Wars). Pestilences (like that of 1628/1630, described by Alessandro Manzoni in his I Promessi Sposi) and the generally declining conditions of Italy's economy in the 17th and 18th centuries halted the further development of Lombardy. In 1706 the Austrians came to power and introduced some economical and social measures which granted a certain recovery. Their rule was smashed in the late 18th century by the French armies, however, and with the formation of the Napoleonic Empire, Lombardy became one of the semi-independent province of Napoleonic France. The restoration of Austrian rule in 1815, in the form of the puppet state called Kingdom of Lombardy–Venetia, had however to contend with new social ideals introduced by the Napoleonic era. Lombardy became one of the intellectual centres leading to Italian unification. The popular republic of 1848 was short-lived, its suppression leading to renewed Austrian rule. This came to a decisive end when Lombardy was annexed to the Kingdom of Italy 1859 as a result of the Second Italian Independence War. Starting from the late 19th century, and with a boom after World War II, Lombardy confirmed its status as the most economically developed area of Italy. When annexed to the Kingdom of Italy in 1859 Lombardy achieved its actual territorial shape by adding the Oltrepò pavese (formerly southern part of Novara 's Province) to the province of Pavia . 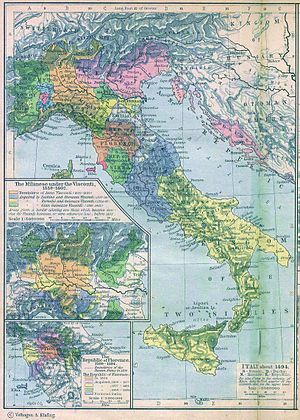 In January 1, 1927 due to a general setup ordered by the Fascist regime, Varese became independent by subtracting to Como some 40 towns up to the Lake Maggiore and to Milan the Busto Arsizio 's and Gallarate 's cities. Two other provinces had been constituted in March 6, 1992. Lodi's province was formed cutting out of Milan 's southern territories up to the Po River. However,one town, (San Colombano al Lambro ) didn't agree to the new settlement and, even if 40 km far away from the Provincial capital, is still depending from Milan . The Province of Lecco split away from Como Province through the cutting out the latter's eastern territories. 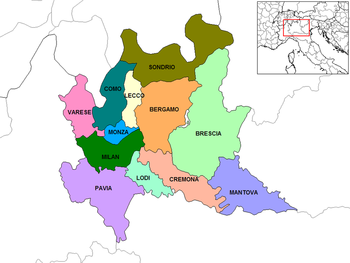 In 2004, the Monza and Brianza province was also constituted, having Monza as administrative center - in June 2009 the first elections were held. One sixth of the Italian population or about 10 million people live in Lombardy (16.2% of the national population; 2% of the European Union population), making it the most densely populated region in Italy after Campania with a strong concentration in the Milan metropolitan area and the Alpine foothills areas of the provinces of Varese , Como , Lecco , Monza and Brianza and Bergamo , (1,200 inh./km2), a lower average density (250 inh./km2) in the Po area and the lower Brescia valleys, and much lower densities (less than 60 inh./km2) in the mountain areas and the Oltrepò Pavese. The growth of the regional population was particularly high during the 50's, 60's and 70's, thanks to sustained economic development, high birth rates, and strong migration flows (especially from Southern Italy). During the last two decades, Lombardy became the destination of a large number of foreign immigrants, so today more than a quarter of all foreign immigrants in Italy lives in Lombardy. As of 2008, the Italian national institute of statistics ISTAT estimated that 815,335 foreign-born immigrants live in Lombardy, equal to 8.4% of the total regional population. The primary religion is Catholicism; significative religious minorities include Christian Waldenses, Protestants and Orthodox, as well as Jews, Sikh and Muslims. The gross domestic product in Lombardia (equal to over €298 billion in 2005. ) accounts for almost one quarter of the total gross domestic product of Italy. When this measure is considered by inhabitant, it results in a value of €31,600 per inhabitant, which is almost 25% higher than the national average of €24,300. Lombardy's development has been marked by the growth of the services sector since the 1980s, and in particular by the growth of innovative activities in the sector of services to enterprises and in credit and financial services. At the same time, the strong industrial vocation of the region has not suffered from it. Lombardy remains, in fact, the main industrial area of the country. The presence, and development, of a very high number of enterprises belonging to the services sector represents a favourable situation for the improvement of the efficiency of the productive process, as well as for the growth of the regional economy. The region can broadly be divided into three areas as regards the productive activity. Milan, where the services sector makes up for 65.3% of the employment; a group of provinces, Varese, Como, Lecco, Bergamo and Brescia, highly industrialised, although in the two latter ones, in the plains, there is also a rich agricultural sector. Finally, in the provinces of Sondrio, Pavia, Cremona, Mantova and Lodi, there is a consistent agricultural activity, and at the same time an above average development of the services sector. The productivity of agriculture is enhanced by a well-developed use of fertilizers and the traditional abundance of water, boosted since the Middle Ages by the construction (partly designed by Leonardo da Vinci) of a wide net of irrigation systems. Lower plains are characterized by fodder crops, which are mowed up to eight times a years, cereals (rice, wheat and maize) and sugarbeet. Productions of the higher plains include cereals, vegetables, fruit trees and mulberries. The higher areas, up to the Prealps and Alps sectors of the north, produce fruit and vines. Cattle (with the highest density in Italy), pigs and sheep are raised. The Politics of Lombardy takes place in a framework of a semipresidential representative democracy, whereby the President of Regional Administration (Presidente della Regione) is the head of government, and of a pluriform multi-party system. Executive power is exercised by the Regional Government (Giunta Regionale). Legislative power is vested in the Regional Council (Consiglio Regionale). The Christian-centre party of Democrazia Cristiana (DC) maintained a majority of the votes and rule of the most important cities and provinces until the late 1980s; support for the other traditional major force of Italian politics, the Italian Communist Party (PCI), was increasingly eroded by the Partito Socialista Italiano (PSI) until, in the early 1990s, the Mani Pulite corruption scandal which spread from Milan to the whole of Italy wiped away the old political class almost entirely. This, together with problems caused by immigration and the general disaffection towards Rome's government (considered as favouring excessively the less developed regions of southern Italy in economical matters), led to the sudden growth of the separatist party of Lega Lombarda (later Lega Nord), with somewhat plebiscitary consensus especially in agricultural areas and minor cities of the region. Today Lombardy is a stronghold of the House of Freedoms coalition, and gave about 60% of its votes to Silvio Berlusconi at the 2008 national elections.